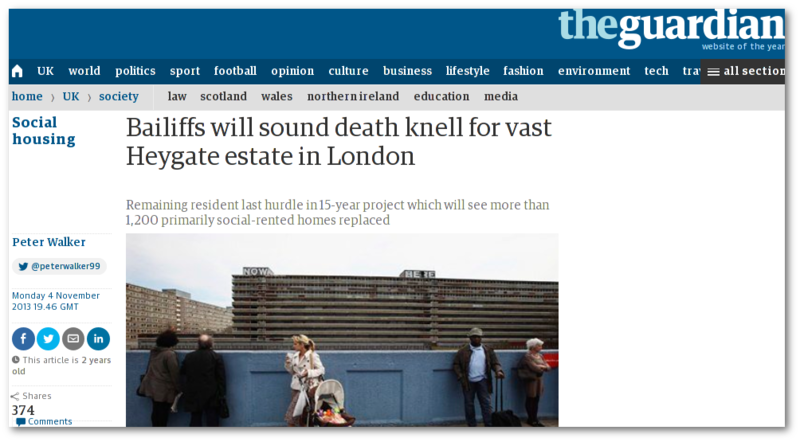 The Local Government Ombudsman has delivered a damning verdict on Southwark’s eviction of the last leaseholder from the Heygate estate. She has ruled that Southwark was at ‘fault’, causing the leaseholder an ‘injustice’ and has directed that Southwark give a written apology and make compensation payments amounting to over £11,000. She further directed that Southwark produce proper policies and procedures for dealing with the compulsory purchase of leaseholder properties. Southwark Council has agreed with the Ombudsman’s proposals for remedying the injustice. failed to make an advanced payment of compensation to the leaseholder, as required to by compulsory purchase order (CPO) law, preventing the leaseholder from rehousing himself1. failed to offer any alternative accommodation, also required by CPO law2. sent in the bailiffs, unnecessarily turning the leaseholder onto the street. unjustly charged the leaseholder the bailiff’s costs. She further found that Southwark had no policies or procedures for dealing with the compulsory purchase of leaseholder properties and for making advance payments of compensation to them. After commenting that ‘the compulsory purchase of a person’s home is a serious matter’ and ‘given the nature of the process they would be going through, one might reasonably expect them to be given more, rather than less, help’, she concludes that ‘there was a clear lack of a co-ordinated approach by the Council’. The Ombudsman’s findings come after a complaint from the leaseholder Adrian Glasspool and his brother about the eviction, which took place in November 2013. The payments she has ordered refunded the cost of the bailiffs, which Southwark had deducted from the Glasspools’ compensation and the professional fees the Glasspools incurred as a consequence of the eviction, plus a small ‘time and trouble’ payment. Southwark had previously made a payment of £500 in compensation for an iPhone stolen during the eviction. An FOI request for information relating to the eviction could not be met because Southwark had lost it all “due to technical difficulties”. The Ombudsman issued her draft decision in Sept 2015; Southwark then haggled over the detail, so the final decision was not issued until Jan 2016 and the recommended payments not fully made until May 2016. Among other things, Southwark was anxious that the Ombudsman should omit a reference from the draft decision notice, to it taking a particularly tough line with the Glasspools, because it believed they were “politically motivated”. The Ombudsman agreed to do this. Southwark also made the desperate and bizarre claim that Mr Glasspool had never in fact requested an advance payment, despite this being the subject of the complaint for nearly three years. The Ombdusman gave this argument shorter shrift, noting both that Mr Glasspool had a delivery receipt for the request and that it was a matter only raised after the complaint had been referred to her. A charitable interpretation of this case is that Southwark are simply incompetent. A more realistic interpretation is that it is hostile to leaseholders on estates it earmarks for regeneration. We have previously blogged about Southwark’s outrageous practice of calculating leaseholder compensation on the Aylesbury estate by using overcrowded 4-bed flats (illegally converted from 1-bed flats) as comparisons. Southwark’s ‘incestuous’ valuations and its use of staff who are neither qualified nor RICS registered to conduct evaluations has also been criticised. The conclusion must be that the absence of any policy or procedures that the Ombudsman notes is a deliberate tactic on Southwark’s part, one which allows staff to do as they please. Nor does it look as if this will change anytime soon; despite agreeing to the Ombudsman’s recommendations Southwark has also said that it will not introduce policy or procedure changes, until the implementation of the Housing and Planning Act 2016, just passed by Parliament and not likely to be implemented for another year.